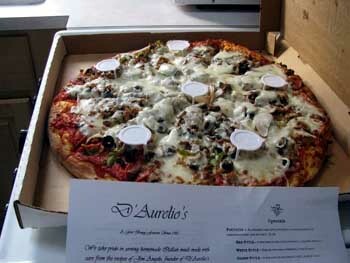 D AURELIOS Restaurant n Pizzeria Fort Bragg, California - "Like Coming Home for Delicious Italian Cuisine Prepared by Mom"
Homemade Pizza & Italian Dinners. A frenzy of hungry locals and visitors waiting for some of the most delicious homemade comfort food, found in the friendly small town of Fort Bragg. Rose Cortez has cast a spell on anyone lucky enough to find her popular eatery - much like in the Disney Movie "The Sorcerer and the Apprentice". She lines them up at the door every evening and feeds them her delicious homemade Italian faire. 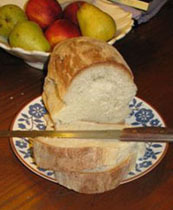 Dinner begins with their famous Italian bread which is baked fresh daily; its so good folks buy it by the loaf. They offer a variety of pasta meals which come with a choice of their delicious homemade minestrone soup or a fresh salad and choice of dressing (try the house salad dressings; Italian ranch or creamy Italian - they are delicious). The pasta meals are very generous portions (ranging from $12 - $15 for a 1/2 order or $17 - $20 full order) with a choice of marinera, pesto or alfredo sauce. Meatballs, Italian sausages, chicken and even delicious shrimp pasta and cod (seasonal) are some of the many meals to choose from. They also offer a variety of options for vegetarians, such as delicious primavera (fresh steamed vegetables), or pesto pasta. The lasagna, eggplant and cheese and spinach raviolis are very popular, and the sandwiches and anti pasta salads ($11.50 for 1/2 order and $15.50 for full serving) are quite a site - very large indeed! The Pizza ovens are a beehive of activity with over 24 toppings to choose from to make those extremely filling pizza pies. Crusts are baked thick to thin with homemade red or pesto sauce served light, medium or heavy. There is also an assortment of bottled micro brewed beers, California wines, mineral water and soft drinks and draft beer by the glass or pitcher. If you haven't tried D'Aurelios yet then you're in for a treat, Rose and her staff will treat you like one of the family, come in tonight ans see what's cookin! WHAT ARE PEOPLE SAYING ABOUT DINING AT D'AURELIO'S? "This place is probably the best pizza in town (although I haven't tried the newer spot by the Company Store). They have a large menu with many different selections, so anyone can come in and find something to eat. They offer a lot of different options for pizzas besides the toppings, like the amount of cheese and sauce and the thickness of the crust. 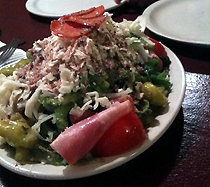 The wait staff can be a bit slow with refills, but overall this place is pretty good." 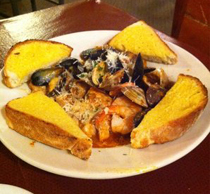 "The Cioppino here is the best I have ever had. It is a generous portion with good quality seafood (even if lacking crab) but the sauce is what makes it. Slightly chunky and very, very rich it is just perfect. It comes with a small side of garlic bread but do yourself a favor and order another half order to soppe up all that sauce." "Service was friendly but sloooow. I know they were backed up but they are always backed up. It took us 15 minutes to addressed, after waiting an expected 15 minutes out side." "There was a pretty big line outside, but we got in after only about 10-15 minutes. We just grabbed a menu and used the time to choose what we wanted to order." "Definitely would recommend! We got the medium pizza and half antipasto salad and it was more then enough for me, (9 mos pregnant), 2 14 yr olds, a 9 yr old, and a 2 yr old. WE took half the pizza back to the cottage." "This is a great small-town pizza joint. They make the best fresh bread, which is placed on your table while you order. This bread is truly amazing." "We ordered a mini pizza (10 inch) and a half order of pesto pasta, which came with house salads. All of this was $30. The portions are HUGE. We took home half of the pizza and half of the "half" pasta order because we were so stuffed."